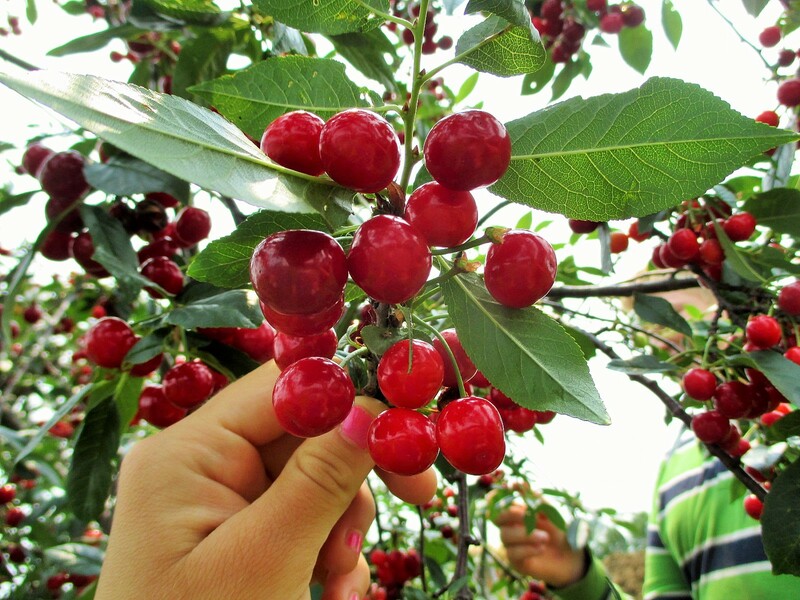 Beautiful crop of pie cherries! 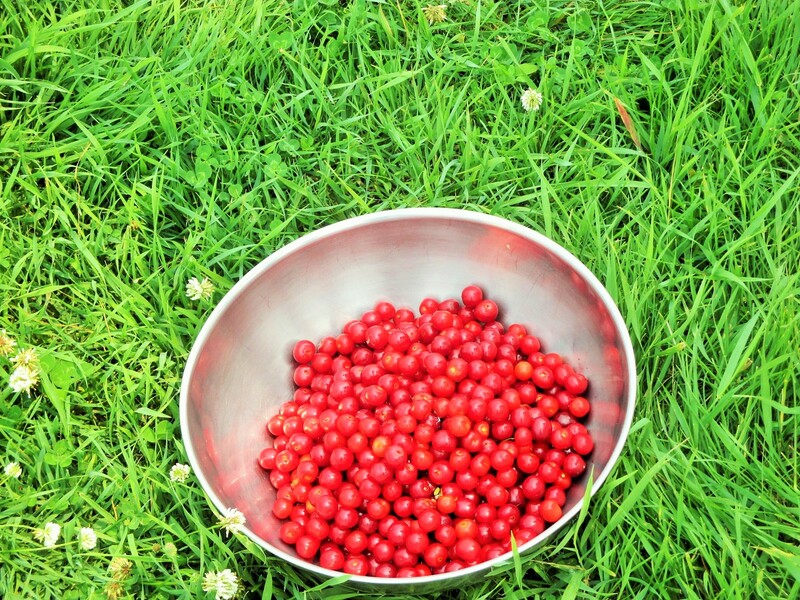 The honey bees are responsible for a bumper crop of cherries this year! So far we froze enough for 28 pies or desserts. Tomorrow we are bound and determined to finish the job! The cherries make the most delicious pies ever. It would be easier and way less time-consuming to buy the fake cherry pie filling but that’s not an option. High fructose poison with red dye……….yuck. Picking, washing, pitting and packing takes so much time but it’s so worth the effort. Cherry trees ready to pick. Fruit from the tree, work of human hands. 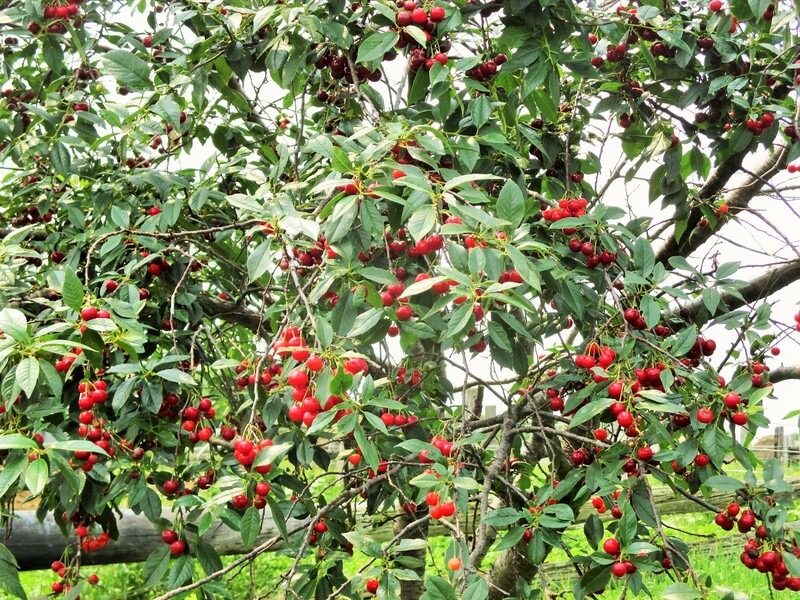 There were two other smaller cherry bushes which, after harvest, have been turned into a very delicious and beautiful jelly. You’ll have to take my word for it since I didn’t take any photos of that job! We’ve been staying really busy with summer farm work. I can’t believe it’s been over a month since I last wrote. More posts coming soon! This entry was posted in FARM KITCHEN and tagged Cherry pies Callens honey farm. Bookmark the permalink. what lovely cherries — yes, we have to put up whatever crops make each year, and you never know what’s going to do well and what’s going to get a blight, or never germinate, or what. Every year is different, isn’t it? Looks great, Sandra… what kinds of cherry trees are those? We are getting ready to plant some here in NH… hugs to all of you..
Can’t remember the name of the trees but they are fairly sour. Hugs on back to you Lamby. No one remembers the name of the cherry trees 🙂 Some northern type of trees. Thanks for the hugs!